The American Express EveryDay cards earn Membership Reward points. There are two versions, the no annual fee EveryDay and the $95 annual fee EveryDay Preferred. Which one is best for you? You can view credit card offers by going to the "Credit Card Offers" tab. Find offers for the respective cards in "Point Rewards Credit Cards." You don't have to use our links, but we're grateful when you do. Thank you for supporting AskSebby! For this video, we're not going to consider the signup bonus because we're looking for long-term value. The Amex EveryDay card earns MR points, not cash back like the Amex Blue Cash card. The benefit of MR points is that they are worth more than cash back, depending on how you use them. To determine which version of the card is best for your lifestyle, we created a spreadsheet to help you crunch the numbers. 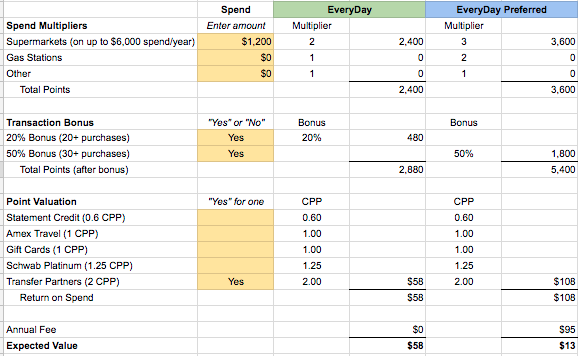 In the top half of the spreadsheet, enter how much you spend a year on groceries, gas, and everything else. One important factor is how much cash back your other credit cards earn. For example, if you have the Citi Double Cash card, you would use it for everything else. Enter how much you spend per year on groceries, gas, and other expenses you plan on putting on the card. I spend about $100/month on groceries, which comes out to $1,200/year. I don't own a car, and I have cash back cards that earn more than 1% on all other transactions. Let's assume we hit the transaction bonus for each card. At first glance, the Preferred seems like it's the better card, but this is without considering the annual fee. Type in "Yes" for the one way you intend to use the Membership Rewards points. In our example, we chose transfer partners to get 2 cents per point. In our example, once you consider the $95 fee for the Everyday Preferred, we can see that the Everyday card comes out ahead. The expected value for everyone will be different, so be sure you're getting positive expected value for whichever card you choose.